And some of the things people had posted in the comments section really brought that home to me. One person wrote, “everyone needs to be a perfectionist to a lesser degree, otherwise complacency and laziness sneak in”. My personality dictates that I think things through, work hard on the projects I design and make, and that I pay attention to every last detail. It’s what I do, and it’s one of the reasons I’m lucky enough to have clients who keep coming back to me. This isn’t the same as the kind of perfectionism the blog post is talking about. Working hard and paying attention to details doesn’t involve being afraid to get started on a project in case the outcome isn’t good enough. It doesn’t involve feeling physically unwell if you make something you don’t like, and it doesn’t involve taking a whole day to make a single, simple greetings card. The suggestion that without perfectionism your only option is to be “lazy and complacent” really bothers me. It’s like saying there’s no middle ground between being happy and suffering clinical depression. You can feel happy, feel depressed or be somewhere in between the two, but feeling depressed isn’t the same as having depression. In the same way, I think I have finally realised that you can be – if not perfect - very good, you can be bad or you can fall somewhere in between. Perfectionism is a separate issue altogether. So, what in the name of rare and possibly unwarranted confessions does this have to do with Copy+Pasting, you’re thinking. Enough with the blethering – you want some pretty pictures, right? Well, taking the blog post as my starting point ‘copy’, I put it to the ‘paste’ test. My challenge was to pick a project, the first thing that came into my head, and finish it in two hours, posting the results here, no matter whether the end result was ‘perfect’ or a total mess, or even if I liked it. Which is what I (almost) did. The project was a cushion for the sofa in my living room – a worthy and most appropriate candidate. We’ve been living in this house for exactly 11 months and 1 day. A week after we moved in, I bought two plain white cushion pads, planning to cover them with something pretty. They’ve been sitting here looking pasty and unloved ever since, because I haven’t been able to think of the ‘perfect’ thing to do. Ah – Bonjour, Monsieur Perfectionsim! Can’t think of the perfect thing? Don’t do anything at all. That’s how it works. In the end, two hours was unrealistic (patchwork? Not the best choice for quick, easy and fuss-free). It took me almost double that length of time, but I finished it and it didn't take a whole day (or more). That's a start, I think. :: My tastes are a little less sweet and pretty than I thought. :: My sense of time (and timing) is wonkier than the seams in a rushed piece of patchwork. :: The time I usually spend thinking and planning is important. Sometimes ideas come in a flash and work out just as you imagine, but more often they need time to stew. 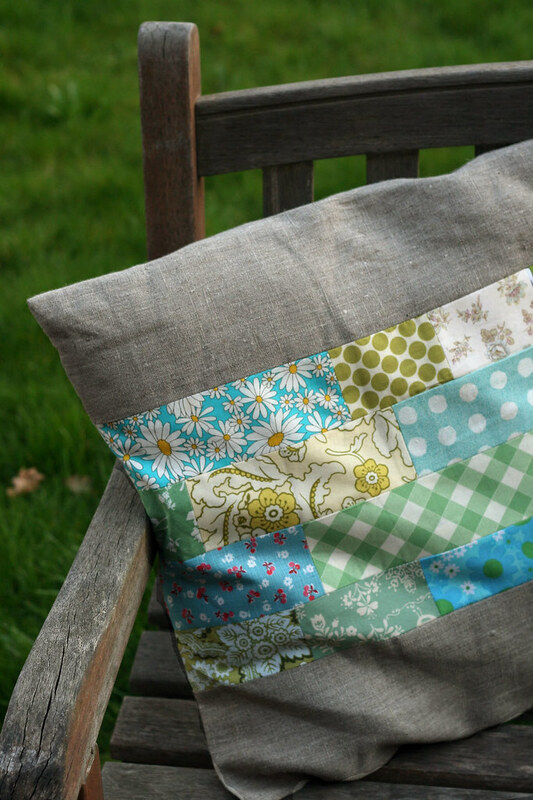 I think the reason I don’t like my cushion is because there’s no thoughtfulness behind it – it’s a thing made for thing’s sake, and it feels kind of soulless because of it. Over-thinking is bad, but considered thinking is good! :: I need to make more stuff. Some days it feels like I make lots of things I don't like that much. When I look back and properly assess this, it probably works out to be half and half - about 50% of my projects I really do like. The law of averages would say that the more I make, the more stuff I'll have to be happy with, and also, the more I'll get used to being ok about the less-successful bits. Now you, equally marvellous pasters, how does all this apply to you? First of all, if you have similar perfectionist issues, then go – READ – right now. If not, I hope there are still a few things here that might spark a project or two. For the time-starved (that’s just about all of us, I guess), maybe pick a project and give yourself a set time-frame to finish it. You might want to be slightly more realistic with your end goal than I was, but seeing something through, start to finish, in one sitting is peculiarly satisfying. It’s also quite useful if you’re struggling to hone your style. Two of the above points helped me with this (the first and third ones), and working on something so quickly and spontaneously also allowed me to look at the end result more objectively than usual. 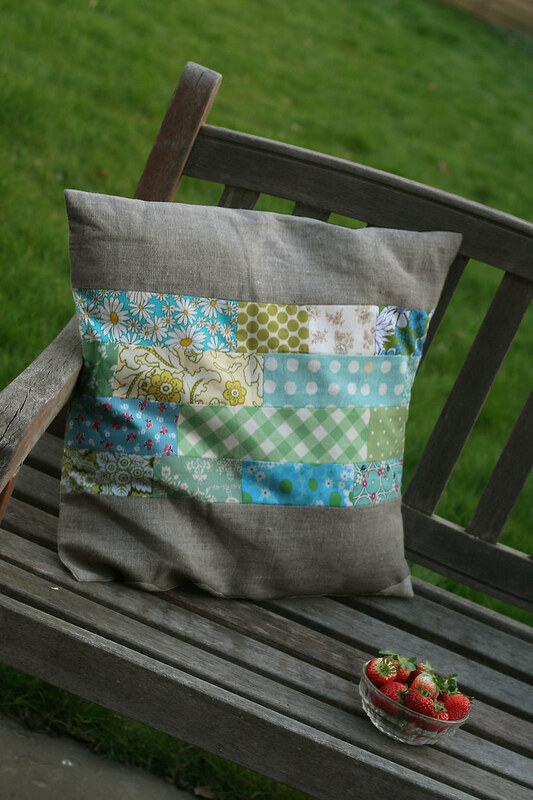 Even if all you take away is the urge to try a little patchwork, you know we’d still love to see what you come up with. Post your pastings in the comments below, or share them in the Copy+Paste Flickr group. Julie will be back with another post here on Wednesday - just don't be surprised if she sends you spinning off in an unexpectedly challenging direction. PS. For what it's worth, I love pretty much all of your projects! I have been living with someone elses choice of curtain for 12 years because I can't find the right pattern! And now I have actually bought some fabric (which I am still not sure about) I am putting off making them because I don't like the curtain pole! I do love the story about craftsmen who used to put a deliberate mistake in their work because only God is perfect! i think i fall more in the lazy category then the perfectionist! 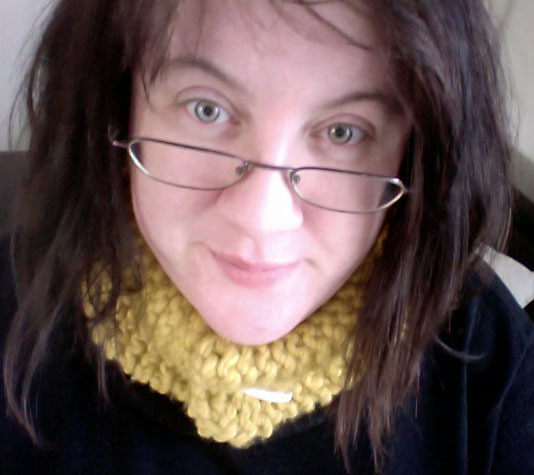 But i do have a few embroidery projects that are unfinished, namely the Kitschy Digital Cameras. 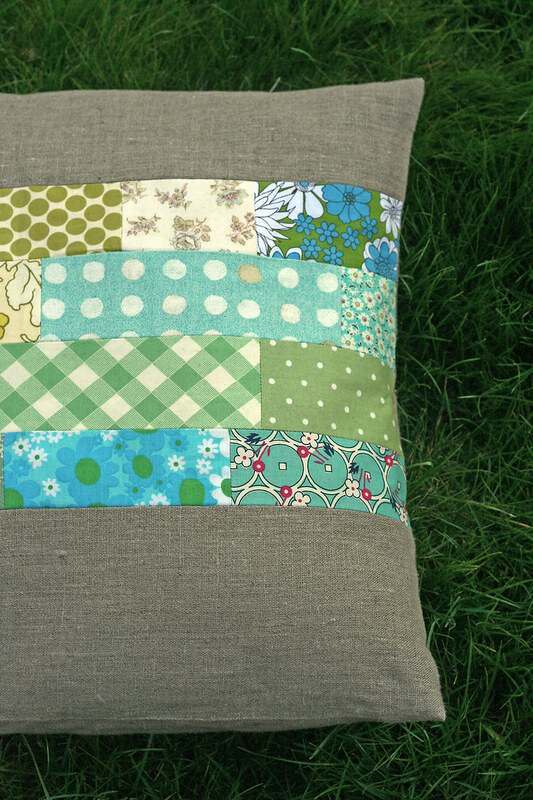 i love your cushion, such a fab mix of fabrics & one of my favourite colour combinations ever! Might try and use my paper scraps for a patchwork effect next time i'm scrapbooking.